Ports of Call: Athens Greece, Augusta Bay Sicily, Taranto Italy, Cannes France, Barcelona Spain and Palermo Italy. Over 229 photos and the ships story told on 81 pages. 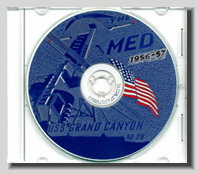 Once you view this CD you will know what life was like on this Destroyer Tender during the specified time period.